Nonspecific intraventricular conduction delay exists if the ECG displays a widened QRS appearance that is neither a left bundle branch block (LBBB) nor a right bundle branch block (RBBB). Thus, the appearance of nonspecific intraventricular conduction delay may be rather nuanced. 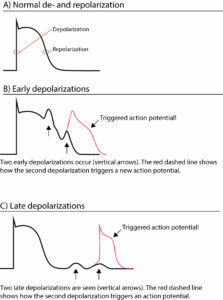 These conduction delays may be observed after large myocardial infarctions , in which the large necrotic area may cause nonspecific conduction disturbances. Such conduction disturbances may also be superimposed on existing bundle branch blocks and alter their appearance. Some patients develop nonspecific intraventricular conduction defects without any change in their QRS appearance. Such conduction delays may be due to myocardial fibrosis, amyloidosis, cardiomyopathy or hypertrophy. Patients with NICD are at almost twice as great a risk of all-cause death and cardiovascular death, as compared with patients without NICD, including those with RBBB and LBBB. This was reported in the Coronary Heart Disease Study,  which enrolled 10,899 participants with baseline ECG examinations. Individuals with NICD were at particularly high risk of arrhythmia associated deaths. Note that other causes of wide QRS complex must always be considered. For example, Wolff-Parkinson-White syndrome (WPW), pacemaker stimulated beats, electrolyte imbalance and medications may prolong the QRS complex. Aro AL, Anttonen O, Tikkanen JT, et al. Intraventricular conduction delay in astandard 12-lead electrocardiogram as a predictor of mortality in the generalpopulation. Circ Arrhythm Electrophysiol 2011;4:704–710. Eschalier R et al. Heart Rhythm. 2015 May;12(5):1071-9. Nonspecific intraventricular conduction delay: Definitions, prognosis, and implications for cardiac resynchronization therapy.